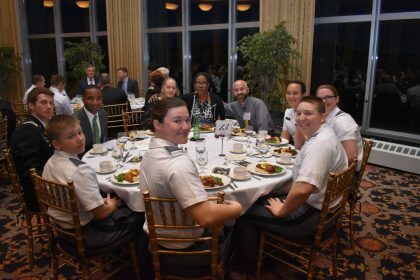 2018 marks the 7th year Knights Out and Spectrum have hosted an annual Gala at West Point. Join cadets, faculty, alumni and friends of the Academy for a social evening overlooking the Hudson, where we will hear from special guests who have made a difference in every corner of the Armed Forces and beyond. Help the UUCRT continue our proud tradition of welcoming and supporting the LGBTQ community at West Point. You can help in one of three ways. You sponsor someone to attend, you can attend the dinner, you can both sponsor and attend the dinner. Our goal is to once again to be a Black Level Sponsor and contribute $1,000. As a Black Level Sponsor, the UUCRT will be recognized in the program and from the podium, will receive four tickets to the dinner, and will be invited to the sponsor only reception with award recipients and special guests. Help us make the goal by March 1 and make your check payable to UUCRT with “Knights Out” the memo line.